Seems like it’s a morning of video footage, as apart from the Samsung Galaxy Nexus being in the forefront of the news today, we now have another hands-on video for your viewing consideration below, a hands-on with another Android smartphone, the newest handset in the Droid line, the Motorola Droid RAZR. 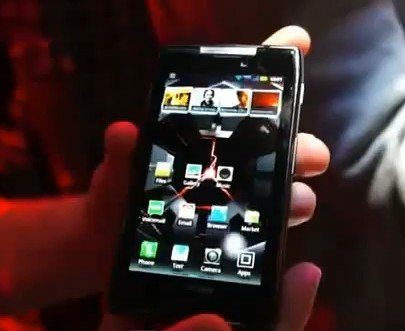 The Motorola Droid RAZR hands-on, Review & Specifications video comes our way courtesy of Deadly News and delivers two and a half minutes of getting up close and checking out the Droid that sports the famous reincarnated RAZR name. Spec wise that Motorola Droid RAZR packs a 4.3-inch Super AMOLED Advanced qHD Gorilla glass touch screen, 8 megapixel rear facing camera, HD front facing camera, 1080p video, Bluetooth 4.0, 1.2GHz dual core processor, Android 2.3.5 Gingerbread OS, 4G LTE connectivity, 1GB RAM, 32GB memory made up of 16GB internal and 16GB preinstalled microSD card. The Motorola Droid RAZR is a sweet 7.1mm in thickness and weighs in at a light 127 grams, and will be up for pre-order from the Big Red in the US as of the 27th of this month, no word on whether the Droid RAZR will get updated to Android Ice Cream Sandwich, but it’s a good guess it will at some point in the future. Okay, that’s your lot, head on down to check out the hands-on footage with the Motorola Droid RAZR, and feel free to let us know if you are going to pre-order the Android handset come the 27th…enjoy.